A wind turbine harnesses kinetic energy of the wind and converts it into electrical energy that is compatible with a residential electrical system. A residential unit is normally served by a wind turbine and a local utility. If the wind has minimum speed of around 7-10 mph then the power is drawn from the utility’s grid instead of the turbine. As the speed of the wind increases, the power generated from the turbine also increases. Hence, the dependence on the utility is considerably reduced. In case power is generated is in excess of the demand from the household, it can be sold back to the utility. This entire process is automated. Most residential wind turbines are ready-to-operate. Individuals who wish to purchase them from the factory need to follow some basic steps during installation which are quick and easy. Self-installation also saves a fair amount of money. It is advisable to discuss individual needs and demands with the local manufacturer to make the most of the wind turbine. Most dealers also offer to install the wind turbines and towers. The high initial investment in residential wind turbines is easily offset by low electricity bills. The electricity bill is reduced by almost 50-90 percent depending upon the wind speed and the amount of usage. Individuals who depend on wind turbines to power their homes have monthly bills of only $8-15. In the long term this amount can also be negligible. As it is considered as home improvement, it also increases the property value. The power generated is pollution-free. Large amounts of pollutants and greenhouse gases can be easily reduced or eliminated over a large period of time. Residential wind turbines can be easily fitted into any home without any additional wiring or equipment. In most cases, a second utility meter is installed to track the amount of surplus electricity produced and sold back to the utility. These turbines do not need a lot of maintenance as they have very few moving parts and operate automatically. A wind turbine capable of generating 5-15 kilowatts is sufficient to meet the 780 kWh per month needs of a home. This range may vary depending on the wind speed in the area. The wind turbine is not suitable for urban homes. 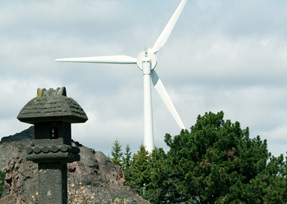 Small wind turbines can be used for a property size of at least one acre. Along with the wind turbine an 80-120 foot tower is provided. The performance of the turbine improves due to the high altitude and also protects the turbine from obstacles on the ground.